Grace Nichols - Poetry Live! Grace Nichols was born and brought up in Guyana, which is in South America but culturally part of the Caribbean/West Indies. After working there as a teacher and journalist, she came to Britain in 1977. Her novel Whole of a Morning Sky gives a taste of that period of her life. 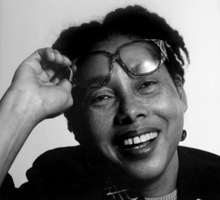 She has published many books of poetry for both adults and children, including the bestselling, The Fat Black Woman’s Poems (1984). Her first collection, I Is A Long-Memoried Woman (1983) retraces the historical journey of an African woman uprooted through slavery to the Caribbean. Among her awards are the Commonwealth Poetry Poetry, the Guyana Poetry Prize and the Cholmondeley Award. Her verse uses both Creole and standard English, often fusing the two tongues, and exploring the rhythmic qualities of musical genres including Calypso, as in her long Carnival poem, Sunris; and Rap as in her Cat Rap from her children’s collection, The Poet Cat. Women’s voices are often the central focus of her work, providing a persona or character through which Nichols spins a fabric of unsung lives, combining sharp imagery and the shifting memories of two landscapes, namely the Caribbean and Britain. She was poet-in-residence at The Tate Gallery, London and in her collection, Picasso I Want My Face Back (2009) she enters the voice of Dora Maar, Picasso’s muse for his iconic painting, Weeping Woman. She lives in Sussex with her husband the poet, John Agard, and their daughters. I Have Crossed An Ocean, her selected poems, was published by Bloodaxe Books in 2010.